Uncommon Sense, A Book by Gregory Sams. Chapter 28. Positive Protest - get fluffy! 28. Positive Protest - get fluffy! It is the growing perception of many on this planet that our society and civilization in the late twentieth century could be compared to a ship that is slowly sinking, or is in such rough waters that sinking is a distinct possibility. Some in our society are trying to repair the damage, building organizations and even new lifestyles that do not threaten the planet. The state reacts by passing laws to hamper activity of this sort and issues blanket assurances that all is well. If we were on an actual ship, the state would certainly have banned lifeboat construction long ago. Perversely, the state's behaviour can sometimes stimulate these activities, not to mention our overall feeling of disquiet. Whether they are correct or not, those who feel a sense of responsibility for our civilization will react to this perceived danger by considering and experimenting with alternative lifestyles and prompting change in the status quo. They will also seek to make their voices heard over the blind assurances of the state that everything is being done for our own good and has been democratically rubber-stamped. Were it not for those people who perceive problems before they become tragedies, society would indeed have a very rocky road to follow. Though bell-ringers of impending disaster are not always right, they should always be heard and considered. Why is it that every nuclear accident or release of toxins to the environment is accompanied by the familiar voice of the state assuring us that there has been no risk to public health or safety? As long as there is a seven year old inner-city child alive without asthma , we will be told by straight-faced government scientists that there is no "scientific proof " of a connection between increasing air pollution and rising asthma levels in children. We vitally need the early warnings of those who are dismissed too often as scaremongers, cranks or some sort of an under-class of dissatisfied troublemakers. There are too many examples to mention of widely noted whistle blowers from Rachel Carson (Silent Spring ) to Prof. Richard Lacey who warned of Mad Cow Disease. ** They, and many others, were dismissed by authority and much of the public but later were tragically shown to be right. These people are not cranks - they question the status quo and prod us from our inclination to complacency when our lives are threatened. Is this not a better service tosociety than the banks of government-employed scientists sworn to the Official Secrets Act and working to who knows what agenda? *This ground-breaking book, published in 1962, was the first to blow the whistle on the destruction of our natural habitat through excessive use of agro-chemicals - primarily DDT at the time. **This respected scientist clearly pointed out the risks and dangers of Mad Cow Disease many years before the government that ridiculed him took any action to contain it. As nation states throughout the world have become more oppressive in their ways we have seen a disturbing move to violence among those who seek to make their voice heard over attempts to silence dissent. Protest becomes frightening when demonstrators with twisted faces are throwing bottles and shouting obscenities at the other side. Such behaviour is alien to most of us, and often clouds our perception of the issue as we seek to distance ourselves from their actions. However, after the disillusioning failure of the CND* movement in the 60's, many lost hope in non-violent direct protest as a vehicle of change and either gave up, approached it from different angles or joined a left-wing group dedicated to becoming the next state by whatever means possible. *The Campaign for Nuclear Disarmament, aiming to BAN THE BOMB, mobilized massive numbers and numerous highly respected figures and intellects of the fifties and sixties. Inspired by Gandhi's non-violence ethic, the protesters would sing rather than sling; their best known tactic was to go limp upon arrest and have to be dragged or carried away. The nuclear arms race continued until defused by the unexpected collapse of the Soviet bloc. Around the world we see that when those without established power or influence are faced with gross injustice, they usually choose the techniques of those in power to try and gain attention for their cause. This has typically been through bombings, shootings, hijacking, organized militias, political assassination, hostage-taking, and the whole array of coercive techniques that have been the stock in trade of world leaders and would-be leaders throughout history. Yet something very new and very powerful is developing, right now, here in Britain. A new culture has developed that is able to stage peaceful acts of dramatic civil disobedience that would have Thoreau, Tolstoy and Gandhi dancing in their graves. Compared to the just lie-down-and-go-limp tactics used by the unsuccessful CND movement of the early Sixties, today's aptly termed "eco-warriors" have advanced from the bow and arrow to the laser-guided smart bomb - if you will forgive the analogy. In the warrior tradition, they set strategies together, but act individually on the field of battle. It is now police practice to assemble a ratio of five police to one eco-warrior before commencing any action. One of the foundations of this power lies in the attitude defined by the word "fluffy," describing their non-coercive approach to dealing in face-to-face, fearless defiance of the full coercive powers of the state. It is not a passive strategy, and having fun is an important part of it. Regardless of where your thoughts lie on the roads issue, it is here that non-coercive direct action was fashioned into an effective working tool; one that the state may never develop a means to "deal with" to their satisfaction. So how did it come into existence? One of the earliest sparks came at the spontaneous and inspired obstruction of a landscape-vandalizing road scheme across Twyford Down in 1993. A group of earth-loving people visiting the proposed road site, became appalled at the thoughtlessness with which the countryside was about to be destroyed, and were inspired to set up the country's first positively staged protest against a road. They came to call themselves the Dongas tribe, after the ancient paths and rights of way that once crossed that land. The final eviction, a black milestone in this country's history, involved four days of often brutal and violent removal by the police and security forces, with a spirited and dedicated resistance by the Dongas. Twyford Down was followed by a passionate and prolonged battle to prevent a bypass destroying the beautiful Solsbury Hill outside of Bath. It is no longer there to enjoy. These early events became the first campaigns of the new eco-war that was to spread across the land following the historic "No-M11" campaign in East London. This year-long action culminated in the peaceful occupation and fortification of Claremont Road, the final street of residential houses waiting to be bulldozed for a 3-mile motorway link of dubious value- set to devour an entire neighbourhood of 300 houses. Most of the original residents had been forced to sell and move out but a few held on defiantly and were soon joined by new neighbours, as the empty houses were occupied by squatters opposed to the building of this road. It became a lively community of people with two cheap vegetarian cafes, more exciting innovative art than you'll see at the Edinburgh Festival, and regular musical events and street parties. All this with a very low rent, though a high demand for courage, innovation, D.I.Y. culture and tolerance. At the final siege on the 28th Nov.1994, after well over a year's occupation, some 200 eco-warriors, using strictly fluffy tactics, held the then remaining twelve houses against an army of 700 heavily equipped police, 300 bailiffs and 400 security guards for a full five days. This dramatic and lengthy final siege/eviction was accompanied by surprisingly few scenes of violence or ugly confrontation, one injury from a fall, and a handful of arrests on which charges were pressed. The final defender to be taken was Phil, not burrowing deep in a tunnel, but plucked from his sleep atop the splendid tower of painted fluorescent scaffolding rising 70ft above the short row of houses. For the first few days, the well-concealed Dolly's Tunnel supplied energy for the sound system and essential supplies to the surrounded protesters. It was named after Dolly, the sharp and lucid 92-year old dear who had refused to leave her lifelong home ("they'll have to carry me out"). She regarded her unconventional new neighbours as modern heroes, fighting today's Battle of Britain against the mindless destruction of our habitat and history by road-building schemes that are often ill thought out, frivolous, or downright unnecessary. Many others in the local neighbourhood shared her views and gave their full support and love to the new community in their midst. *The ethics of this may sit uncomfortably with many readers, as it would with this writer were not cases of its abuse so rare. I also suggest that in those "primitive" cultures which recognized owning the right to use land, but not ownership of the land itself, there may have existed customs and conventions that saw someone lose rights to the exclusive use of land which had for a period of years neither been enjoyed by them nor their tenants - left vacant and unattended. Reclaim the Streets (RTS) arose from this crucible and went on to earn a well-deserved reputation for pulling off some of the most audacious and unbelievable street parties, in between their other ongoing activities, and loosely related events such as the monthly action by cyclists - Critical Mass. 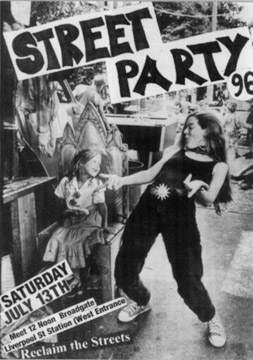 The most stunning was "Street Party 96" that had its own flyer distributed all over the country many weeks in advance. What was the fluffy spirit of Claremont Road to achieve here, with no violence and but one arrest? Nothing less than a giant unauthorized (illegal) street party at an undisclosed major London road, attended by thousands of positive party-goers - all right under the eyes of the police authorities, and in spite of their very determined efforts to stop this party from taking place. The day before the party only four people knew its location; by two the next afternoon there were seven thousand people either at, or on their way to the 800 metre long M41 motorway link in west London's Shepherd's Bush. All six lanes in both directions were smoothly occupied, in a precision action coordinating a truckload of sand "broken down" in the lay-by, the sound system truck likewise, a cavalry of a hundred or more cyclists, some quickly erected tripods with people suspended therein, and thousands of party-goers simultaneously pouring in from nearby tube stations, having assembled earlier at Liverpool St. Station on the other side of London. Once the party started, the police did an efficient and good-natured job of redirecting traffic for the afternoon and evening (with a fraction of the disturbance caused by a single IRA scare). They never donned their riot outfits but quipped: "Thanks for coming, hope you had a good time" to me and many others as we left before midnight. There were caterers at the party, lots of wandering entertainers, children's play-area, carpets thrown down for sitting, a high proportion of the non-status quo attending and, oh yes, two giant Mardi Gras-style moving ballroom gown constructions. One of these settled next to the throbbing sound system for the evening and, as the police helicopter hovered overhead, a pneumatic drill worked away under cover of its skirts and the nearby repetitive beat. This, in order to plant a tree in the fast lane of the motorway - a strongly poetic statement and much better than the usual arsenal of nastiness. It can be difficult for the practitioners of coercion to deal with such non-aggressive and doggedly determined opponents with nothing to lose - something that none of their training covered. Many camps and even an academy of tree-living branched out around the country, increasingly being joined and supported by the older and respectable population of Middle England. These new "recruits" shared a concern over the loss of the countryside and, in contact, realized that these most unusual looking people were kind, thoughtful, polite, responsible and well-spoken examples of the human race - something they often remember with nostalgia from their early years when whole communities like this still existed. Perhaps the most significant offspring of Claremont Road to date was the historic Third Battle of Newbury - waged without violence against the controversial and poorly planned Newbury Bypass route. Between July 1995 and January 1996 some 36 separate camps were built in the path of the proposed route, complete with treehouses, lock-ons, aerial walkways, kitchens, communication facilities, and all the other artefacts of this new mobile community. Many from the local area became involved; both police and guards frequently expressed their support for the protesters position. It eventually took a hugely costly, usually laughable, and sometimes frightening operation by the authorities to exert their will and secure access to the site for contractors Costain. Private security guards, apparently paid directly from Whitehall, had access to confidential police records, and conducted surveillance reminiscent of that practised behind the former Iron Curtain. Phone-taps, infiltration, and all the usual tools of the state were much in evidence. Soon after the thousands of acres of ancient Newbury woodland, historic battlefields, and the 36 protest camps along the route had been taken and levelled, the Minister of Transport responsible admitted publicly that the road protesters had it right and that the Newbury bypass should never have been built along that route. From the safety of retirement, he acknowledged that the well overdue U-Turn in this country's roads policy had been brought about in just a few years by direct action road protest. Though most of the individual battle-stands of this campaign have eventually fallen before the weight of the coercers, it was at Newbury that the war appeared to have been won. Shortly thereafter, at the nearby Fairmile Camp on the route of the proposed A30 extension, the whole issue leapt into the nation's consciousness when one of the many fluffy and determined members of this unique community became a national celebrity as all the sheriffs men were unable to get Swampy out of the tunnel he continued to dig for his record 167 hours stint, only emerging of his own accord when he thought that his point had been made. The public's appetite for a symbolic hero needed to be satisfied and it fell to the well-qualified Swampy to be the first gem to emerge from this rich mine at the very edge of our culture. Other fluffy actions have included the giant canvas mock-motorway somehow draped over the then transport minister's house in the early morning - symbolically laying a motorway over his back yard and house. To protest at the police-state powers granted by the Criminal Justice Act, a "Mystery Excursion" brought several busloads to a picnic held in the garden of the Home Secretary's country house, then held a mock trial in which he was found guilty on various counts. In another anti-CJA action, five audacious men scaled the rooftop of the Houses of Parliament of the eve of Guy Fawkes night.. Profiled against Big Ben, they unfurled a large banner, smoked a large joint and called the press on their mobile phone - coming down only as the cold rainy night progressed. No charges were made following any of the above actions. Fluffy does not see people of any type as an enemy just because they wear a particular uniform, are a different colour or practice a strange religion. Fluffy does not invite baton charges nor incur them in most instances. Fluffy behaviour is seen to work better than violence and that is why it has become established as the preferred "modus operandi" for Britain's new breed of action-oriented bell-ringers. Fluffy is also adopted as a powerful guiding principle in life and relationships. Even the police show it increasing respect as they realize that they are unlikely to ever confront brick throwing, punching or even verbal abuse much stronger than "Get a real job" or "What will your grandchildren think." Today's eco-warriors display a constant level of inspiration and innovation, evolving techniques that can be sometimes be likened to those of the martial art of T'ai Chi Chuan in which a minimum of graceful movement takes the opponent's energy and turns it back with even greater force. It is combined with a powerful commitment to a DIY* culture which takes personal responsibility for tasks in hand, without any defined leadership or hierarchical control structure. * Originally, DIY referred to Do It Yourself home building and decorating. It is now applied to an entire lifestyle outside of the mainstream cultural norm. As Merrick says in his book Battle for the Trees: "There's something very amusing and satisfying about using government laws successfully against a government." Humour, including the ability to laugh at the totalitarian aspirations of the state, while sticking a soft spanner in their works from time to time, seems to work better than outrage and paranoia. It certainly maintains morale, raised spirits and higher energy in its practitioners. Most of the techniques and tactics that have developed from this fluffy philosophy serve to disable the adrenal glands and confuse the responses of those who are sent to attack them. The protesters universally seek to treat the police, bailiffs or security guards as human beings rather than the enemy. For some reason, this confused them. Fluffy action is working. It is having an effect on the mainstream culture as millions of so-called "ordinary citizens" realize that valid points are being made by articulate and committed people, without using violence to gain attention. A major scaling down of superfluous road schemes has already taken place and their future development will never be quite so carefree again. General awareness has risen on the issues of air-pollution, animal welfare, nuclear power and our shrinking personal freedom. When the full costs of some of this century's follies are counted by future generations I do not wonder who will be looked upon as the villains and who as the heroes of the late twentieth century. 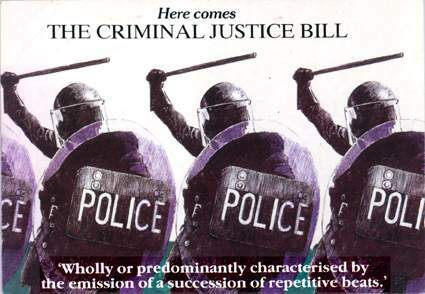 As this new type of protest has developed, the British state has passed - and continues to draft - seriously repressive new legislation designed to make criminal all the aspects of Britain's emerging new culture of which they disapprove. 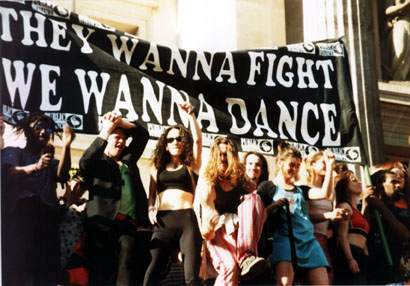 The Criminal Justice Bill 1994 was carefully designed to suppress techno music parties, the right to assembly, the right to protest, and anything else that got up the state's nose. Techno music was legally described as "wholly or predominantly characterized by the emission of a succession of repetitive beats." Look out Bach lovers, you might be next. In the recently rubber-stamped Police Bill, the police are given powers, for instance, to immediately close down any club at which they "suspect" that drug use or trading is going on. They will also be allowed to bug or even burgle anyone who they suspect to be guilty of the "serious offence" defined as being one of "a large number of persons in pursuit of a common purpose." Perhaps Britain's new batch of rulers will roll back some of this tyranny. the emission of a succession of repetitive beats"
Kate Evans postcard Typically, the effect of the legislation passed to date has not exactly been what the government intended. It has served instead to weld together the hundreds of different groups at which it was targeted and thereby to spawn literally thousands more in their wake. At one point the British group LIBERTY was registering nine new groups to stop the bill's passage being formed per day. The "movement" or whatever you choose to call it, has never been stronger or more networked. Thank you Mr. Michael Howard, ex Home Secretary. Indeed, Britain should be actively exporting this new fluffy technology that peacefully and successfully promotes change and self-responsibility. It may well turn out to be one of the most successful mechanisms on the planet today for confronting the implacable face of the state, regardless of financial status.